By filing for Chapter 7 or Chapter 13 bankruptcy, consumers may be able to eliminate credit card?debt. Bankruptcy is designed for people with the most serious debt issues and will not eliminate every kind of debt. Unless a credit card is guaranteed by an asset like a home, it is considered an unsecured debt. Bankruptcy was created to eliminate unsecured debts. If an individual files for Chapter 13 bankruptcy, some of the unsecured debts may need to be repaid. However, those debts that remain after the repayment plan has been completed will be discharged so the individual will not have to repay them. In Chapter 7 bankruptcy, credit card debts are usually discharged. If the estate of the bankrupt individual has enough money, the bankruptcy trustee may use it to repay some credit card debt. It is more likely that the obligation to repay credit card balances will be discharged through bankruptcy. However, exceptions include credit card charges incurred through false pretenses, misrepresentation, and fraud. The court will review the paperwork and approve or deny the Chapter 7 filing. If the bankruptcy is approved, a stay is automatically initiated that prevents listed creditors from taking any action to collect their debts.While the bankruptcy is being processed, credit card debt remains steady provided that the filer does not charge additional purchases. Collectors are forced to deal with the bankruptcy court to recoup charges. The bankruptcy trustee investigates your petition to check for accuracy and, if he/she finds that you have no significant assets?available?for liquidation or sale, the trustee recommends the bankruptcy judge have your credit card debt erased. Chapter 13 is considered reorganization bankruptcy and includes a plan to repay creditors over a three to five-year period. Debts are repaid in varying degrees depending on the priority they are given under bankruptcy law. Credit card debts are classified as general unsecured debts and are assigned the lowest priority for repayment. The amount that must be repaid depends on several factors, including affordability. 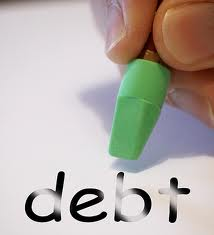 Most debtors are not required to fully repay unsecured credit card debt in bankruptcy. A creditor in a Chapter 13 filing can object to the discharge of credit card debt. Reasons include the debtor?s lack of intent to repay the debt, or incurring credit card debts for luxury items close to the time of filing for bankruptcy. Secured credit card debt is given the highest priority during Chapter 13 bankruptcy and the property securing the debt?such as a car?may be taken by the creditor to satisfy the debt. TIP: Try to negotiate a lower rate before filing for bankruptcy. Today, credit card companies tend to be a bit more receptive to adjusting interest rates on the fly. They know if you are calling them to renegotiate a high interest rate on a high balance, it is probably the first step before heading to a bankruptcy attorney. Instead, they may actually lower the rate and work out more favorable terms. For those where payment is not an option, bankruptcy is the next logical step. Don’t let credit card debt weigh you down any longer – get rid of your pesky credit card debt for good! To avoid getting themselves into hot water with credit cards, consumers should spend only what they can afford to repay within the statement period. Credit card interest rates tend to be high, making a prolonged repayment period more expensive. Credit card default can eventually lead to bankruptcy, which has a lasting impact on the credit status of the individual.